Take a look at this photo. Chest first onto the ground, grass flying everywhere. No matter how much armor you’re wearing, that’s going to hurt. And while it’s nice to have a helmet on to protect the eyes, it’s not going to do anything to protect the neck as it strains against the impact with the ground. George probably woke up pretty sore after that hit. All that to say, paintball can be painful. 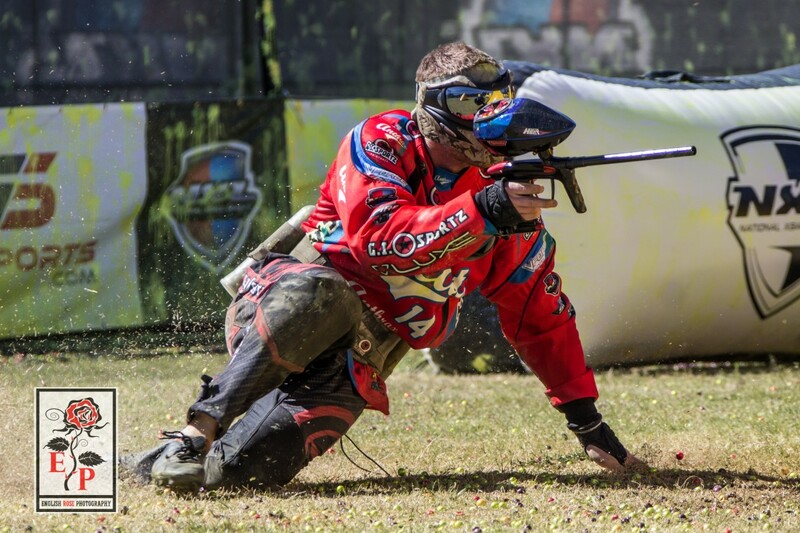 But we go all out, because we want to be known as the action sport in Houston that gets people excited (without all those pesky brain injuries like football provides). We dive to win so that we can take cover and live to fight another round. Take a look at Siewers in this photo. 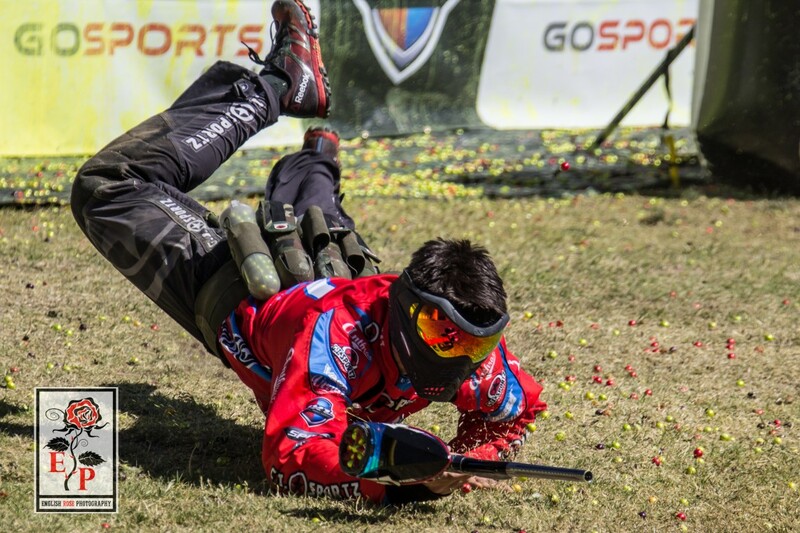 It’s a good example of what it takes to recover when you start sliding in pro paintball. Whether it’s a controlled slide or an accidental one (we play on grass, after all, as you can see from the blades in the air), you need to be able to recover quickly. Take a look at the picture again. He’s in control, he’s aiming, he’s ready to fire, even as his feet are still moving. Squatting isn’t the most noble of positions. There aren’t many glorious things that go on when people squat, no matter what baseball catchers say. But as this photo shows, squatting makes a lot of sense when you want to a) make your body as small a target as possible, and b) be able to pop up as quickly as you can. Sure, it’s not always comfortable, but we do what it takes to make sure we win as often as possible like we did when we came in first in Nashville and Germany this year. We train a lot. We spend a lot of time together, whether it’s here in Houston or on the road at one of our tournaments. And we really get to know each other. 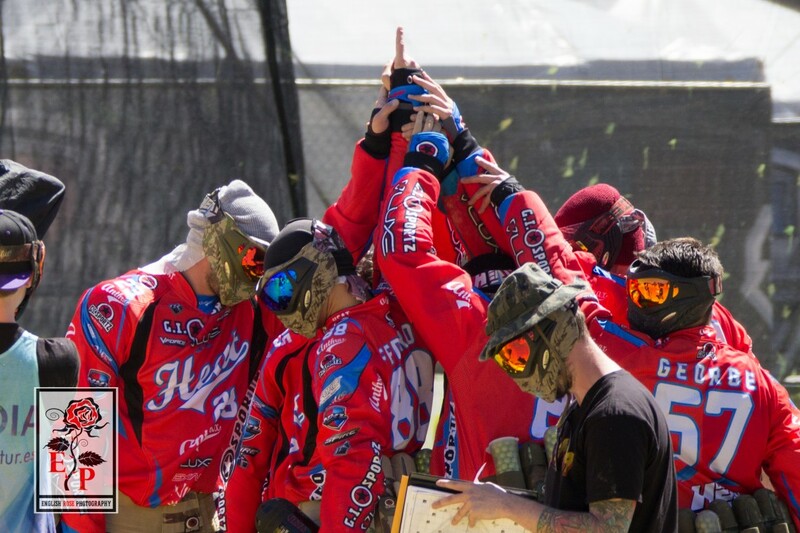 Sure, we know each other personally, but we also respect each other as paintball professionals. Each of us has a role to play, and we always do our best. So when you look at a picture like this, it might not mean a lot to you but it certainly does to us. 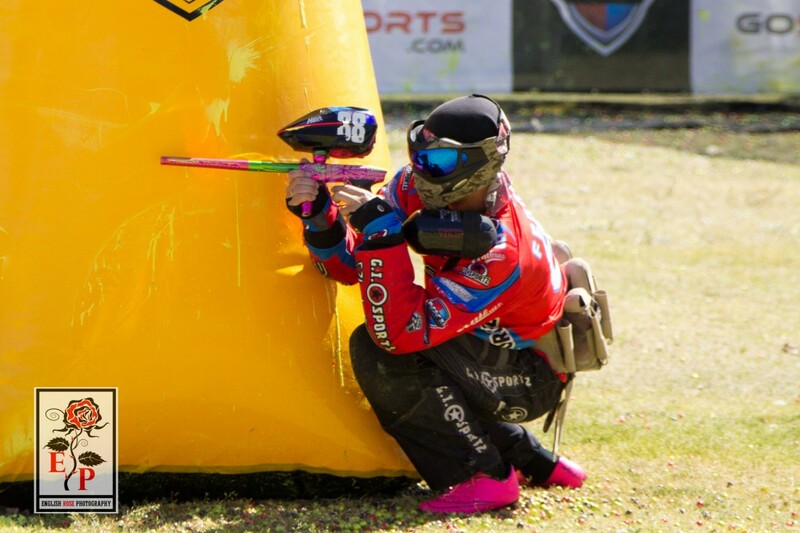 Times like this are the result of countless hours of practicing for this Houston sport, and we do it for us as much as we do for the fans…even though we really love our fans! Pictures say a lot, so thanks for taking this little trip down memory lane with us. And if you have any questions about our extreme sport, be sure to contact us right here.